Zimbabwean-based telecommunications company TelOne recently launched city-wide hotspots giving them a competitive edge to their counterparts. The company, which also recently re-vamped their logo and company profile, has rolled out WiFi hotspots around Harare at a very competitive USD $1 per 100 Mb (that’s about R11 here). To give you an understanding of the market, most competitors charge about USD $10 for the same amount or less. Econet, for example, will give you 80 Mb for USD $5 and 200 Mb for USD $10, which means that using the TelOne service will literally cost you a tenth of the price. The Metro City Wifi is a smart attempt by TelOne to lock into the mobile broadband market given that the majority of internet users in Zimbabwe connect with their mobile phones. It’s also a plus for the brand to fully utilise the mobile operating licence it owns which was gathering dust as they focused mainly on ADSL and telephone line installations. To get connected, users must simply purchase a recharge scratch card which reveals a pin that they dial into their phone. Once in a WiFi Zone, they search for ‘TelOne Wifi’, recharge and connect! Simple. Sources say the company is also considering introducing a time-based model which allows you to use as much data as you want for a specified amount of time (much like most internet cafés). Though the wifi zones are only currently available at spots located around Harare CBD such as Julius Nyerere Way, Runhare House, Montagu Heights and the larger TelOne shops at the Harare Showgrounds, Joina City and Borrowdale, plans are already in place to extend to areas outside of the city. 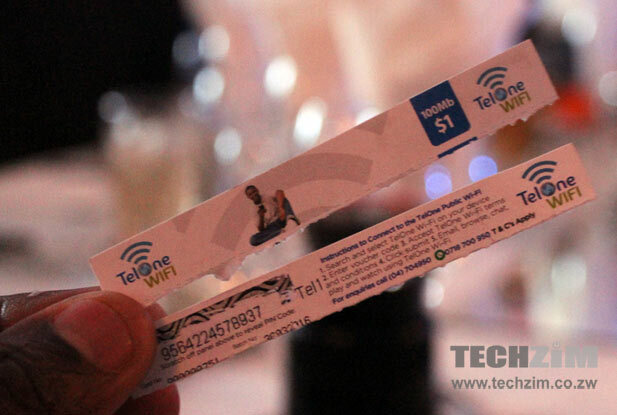 TelOne also aims to roll out a similar WiFi service in Bulawayo in due time, as well as an app which will allow users to buy WiFi access electronically. While TechZim considers the service ‘less integrated’ as it doesn’t allow for existing users to use their current accounts like competitor Econet has done with Econet Zones; I consider the venture into a different market segment a bold and smart one given the demographics allotted to mobile use. Zimbabwean internet penetration stands at a high 40% with a staggering 5.2 million internet subscriptions in the past year. We may have social media to thank in this aspect since people value the ability highly desire the need to keep in touch with friends and family. However reduced mobile broadband costs and increased access to internet-enabled capable feature (and smartphone) handsets – the cheapest of which is below USD $40 – have also made it much easier to get connected. So I guess the question now is what to spend your data on? Have a look at TelOnes WiFi tariffs here and let me know what you think of the service if you have used it. ← Is mobile Africa’s answer?